Dining rooms are the place to splurge on your perfect rug. From your weeknight takeout binge to your fanciest dinner party, you use your dining room constantly. 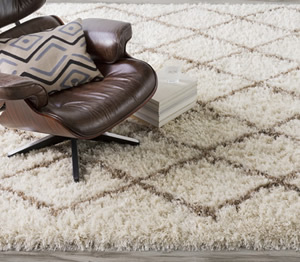 Make sure you pick the best rug for your space by following these easy tips. One of the most important parts to your dining room rug shopping is determining what size you need. So how do you get started? First, define your space. How big is your dining table? How much of your floor do you want exposed? Answering these questions will help you determine the basic dimensions of your rug. If you have a 6 chair dining table, you will likely need an 8x10 rug. If you have an 8 chair ding table, you will likely need an 9x12 rug. If you have a 10 chair dining table, you will likely need a 10x14 rug. 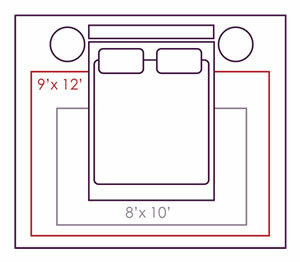 Use these guidelines as a starting point in determining your perfect rug dimensions. You may need to add a few inches to the width or height to make it the perfect size – luckily for you, The Perfect Rug offers customizable area rug sizes for your unique space. In order to really visualize how your new rug will look, try mapping it out with removable painters tape on your dining room floor. Use a tape measure to measure out the sides of your potential new rug and mark with tape. Then connect the marks with more tape, and viola, you’ve got a perfect mock-up of your new rug. Use the above size guide as a starting point, keeping in mind that you’ll want around 18-24 inches of carpet around the perimeter of the dining table. You need enough space to show off that new rug! If you’ve got a large table in a small room, go on the smaller side, and if you’ve got a large room, ere on the larger size. Now is the time to experiment: use that tape trick to try different sizes and find the best one for your space. Okay, so you’ve decided on the perfect size. Now for the fun part! Here’s where you can play around with rug color combinations, borders and patterns to really elevate your dining room. Try identifying existing colors and patterns in your dining room décor and using those as inspiration in your rug search. Need some help? Try a free design consultation on us. Happy designing! Note: Please keep in mind these are just guidelines; custom sizing allows for more precision. Contact customerservice@theperfectrug.com with any questions.